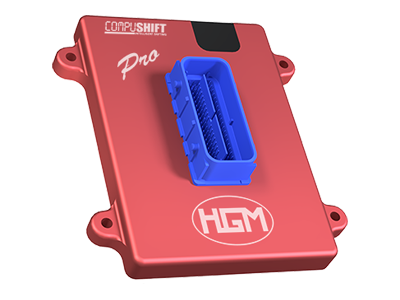 COMPUSHIFT Sport and Pro brings you the first ever smart phone integrated transmission controller. This makes programming dead easy – allowing programming via Android or iOS smart phones, tablets, PC's and Mac's. Connectivity includes both Bluetooth and dual independent CAN bus networks. All software is included. All The Connectors - The COMPUSHIFT Sport and Pro transmission controller looms come with a full set of Plug and Play OEM Connectors for all supported transmissions - making installation effortless. We Have You Covered - HGM is the industry leader in transmission control. We are with you all the way on your project. Note: This product may not be legal for use in California on pollution controlled vehicles. Do you have a unique project in mind? I am guessing: "Hell yes"! Virtually every one of our customers has a custom build. Well, the next step is our "configurator", which will tell you the MUST HAVE's and the NICE TO HAVE's for your specific application of a COMPUSHIFT transmission controller.